Barefoot Resort is primarily a golf resort but it’s situation overlooking the Intracoastal Waterway across from Barefoot Landing, just half a mile from public beach access, makes it a great location for a leisure break. The resort comprises of 4 golf courses with two golf clubhouses, both offering good dining options. The Barefoot Marina. Some of the properties have tennis courts, basketball and volleyball courts. Others have private clubs for guests to enjoy, with fitness centers, waterfront pools and hot tubs. Each community has its own wonderful swimming pool and BBQ facility. Guests also have the privilege of using the main resort pool, the largest in the state, situated on the glistening Intracoastal Waterway. The huge covered hot spa is unbelievable! Miles of sidewalks for walking or bike riding, that gently twist and turn around the golf courses and ponds, provide delightful views. No other grand strand resort offers complimentary shuttle service to the oceanfront, just three blocks from the resort entrance. The seasonal shuttles will pick you up at your community and take you to either the main resort pool, Barefoot Landing or the oceanfront, where you have access to full service bathrooms and vending facilities. There is a wide variety of accommodation to choose from. The 1, 2 and 3 bedroom golf villas provide spacious, well appointed accommodation, many units have golf course views, but not all. 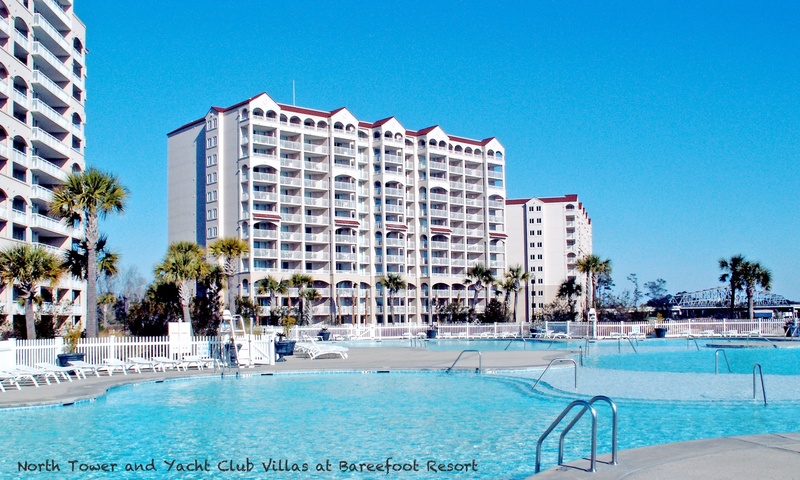 The Yacht Club Villas and North Tower offer outstanding, spacious 1 to 4 bedroom apartments overlooking the Barefoot Marina and Intracoastal Waterway with Barefoot Landing beyond. 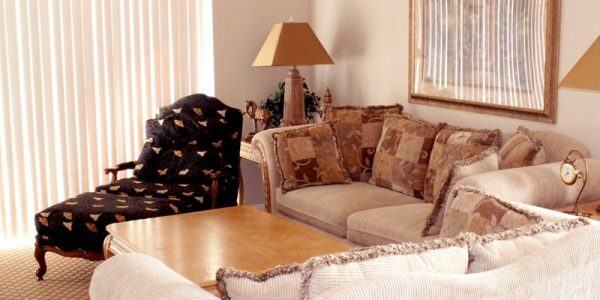 Units are privately owned so furnishings vary but they are generally all finished to a high standard in our experience. Our personal preference would be for the North Tower which has it’s own large outdoor pool and hot tub. Dining facilities consist of the main golf clubhouse which serves breakfast and lunch as well as the Dye Club which is open for lunch and dinner. There is also a bar and pizzeria at the large practice range. This is the premier shopping, dining and entertainment centre in North Myrtle Beach. There are many restaurants and bars to choose from as well as attractions such as House of Blues, Alabama Theatre and Alligator Adventure. With so much to see and do within walking distance of your accommodation, Barefoot Resort really is a fantastic location. Visit the Barefoot Landing web site for more information. Barefoot is one of two resorts where we offer long stay winter packages of 28 days or longer. Temporary golf membership is available, offering massive savings over the standard golf package fees. Check out our long stay packages for more information on a great way to avoid the British winter! 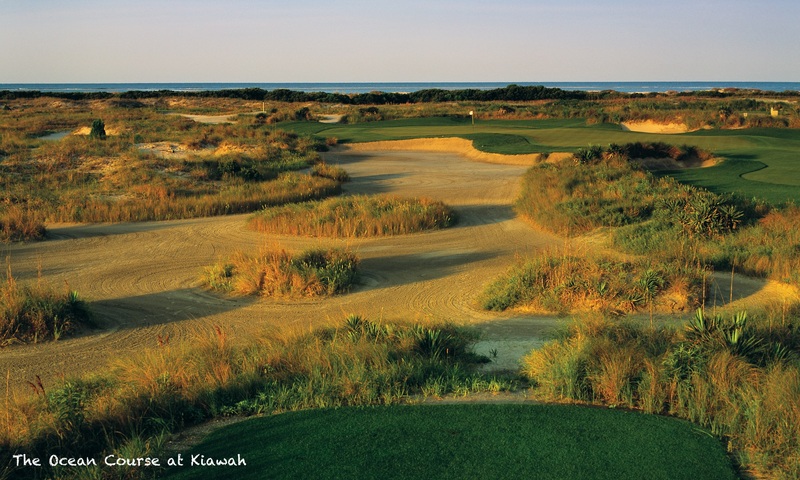 The four on-site golf courses are among the highest rated in South Carolina. The Dye Club is tough links style layout with many typical Pete Dye challenges to overcome. The Fazio Course is arguably the most picturesque of the four. It is the most fun to play, although the Love course runs it close. The Norman course is a very natural layout, typical of Greg Norman designs and has several holes along the Intracoastal Waterway. There are also extensive facilities with 2 practice ranges, a golf school and even a golf retail store on-site offering club matching services. Everything you would need for the total golf package.